We're waiting for your call. Whatever you're going through, a Samaritan will face it with you. We're here 24 hours a day, 365 days a year. We supports schools, college communities and other youth settings through our postvention services, lesson plans and school talks. We work with prison services to reduce suicide and self-harm in prisons. If you'd like to talk to someone face-to-face in a quiet, private space. We're open everyday 9am-10pm. 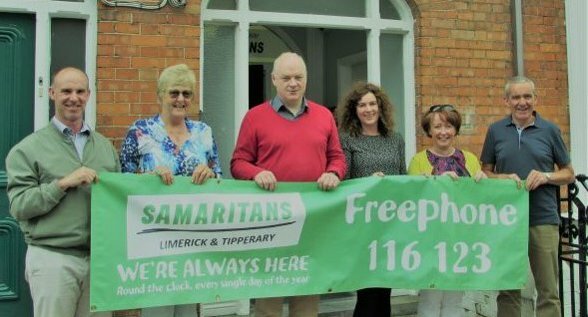 Opening our doors on September 1st 1975, Samaritans of Limerick & Tipperary have served the local community for more than 40 years. All of the services and support we offer is provided by volunteers who pride themselves in being there for people when they need a safe place to talk. From our base at 20 Barrington Street, Limerick, our volunteers support the public via telephone, email, text and face-to-face calls to the branch. We're also active in the local community, working and educating in schools, third level, prisons and supporting the most vulnerable in our society. Samaritans of Limerick & Tipperary is a registered charity (20167448). Samaritans of Limerick & Tipperary is a recognised branch of Samaritans.